According to the Centers for Disease Control and Prevention, 96 percent of Lyme disease cases in 2014 came from 14 states, one of these states being Pennsylvania. Lyme disease can be especially harmful to the elderly, and it’s important to know how to recognize its symptoms in case your senior loved one has been bitten by a tick and needs treatment. Harrisburg 24-hour care experts want to share some information on the symptoms of Lyme disease and how it can be treated. Rash – The rash appears at the site of the tick bite and is characterized by an expanding red area with a clear center. This bullseye pattern rash can expand to as much as 12 inches across and normally is not painful or itchy. Flu-like symptoms – Most seniors with Lyme disease experience body aches, fever, chills, headache, and fatigue. Joint pain – The swelling and pain is typically most noticeable in the knees, but can shift to other joints. In the elderly, this is often misdiagnosed as degenerative changes related to arthritis. Neurological symptoms – In advanced cases, Lyme disease can cause temporary facial paralysis, impaired muscle movement, and numbness and tingling sensations in the extremities. Seniors with health issues like diabetes and neurological conditions may exhibit similar symptoms, which makes accurate diagnosis more difficult. In rare cases, seniors infected with Lyme disease may develop an irregular heartbeat and inflammation of the eyes and liver. Fatigue can intensify to the point it makes activities of daily living almost impossible. Lyme disease can also impair cognitive function and concentration, which may be misdiagnosed as dementia in the elderly. The most common treatment for Lyme disease is antibiotic therapy. Most doctors recommend a 14 to 21-day course of doxycycline. To achieve optimal results, treatment should be started as soon as possible after your loved one has been infected. Seniors with advanced Lyme disease may have to undergo intensive IV therapy. It is important to seek treatment even if the initial symptoms resolve because the disease can resurface months or even years after infection. 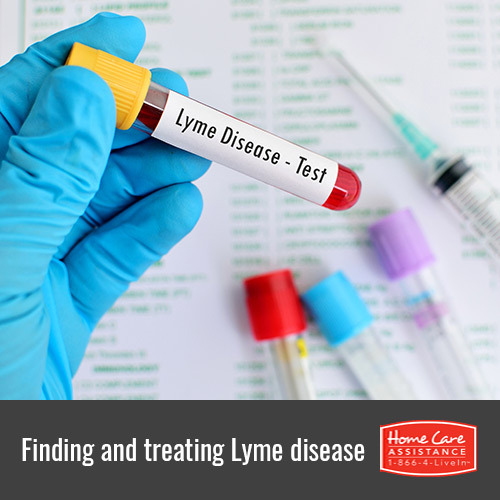 To learn more about Lyme disease and its harmful effects on the elderly, reach out to Home Care Assistance. We are a leading provider of part-time and live-in care in Harrisburg, PA, and our caregivers are expertly trained to assist seniors with a wide array of daily tasks. For more information on the in-home care Harrisburg families trust, call one of our knowledgeable Care Managers at (717) 540-4663 today.